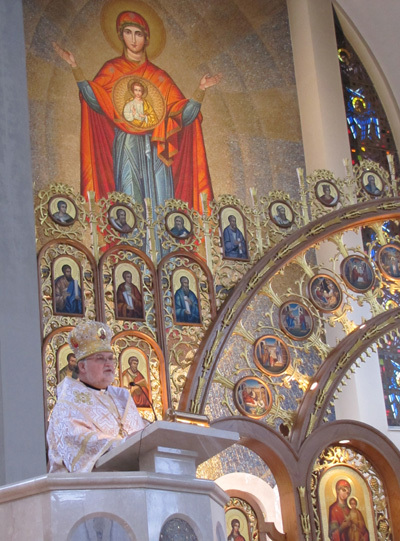 Philadelphia Ukrainian Archbishop Stefan Soroka speaks March 16, 2014 at the Cathedral of the Immaculate Conception in Philadelphia. The announced visit next September of Pope Francis to the Archdioceses of Philadelphia for the World Meeting of Families is stirring excitement. That isn’t a typo — the pope will be visiting the Roman Catholic Archdiocese of Philadelphia, headed by Archbishop Charles Chaput, and the Ukrainian Catholic Archeparchy (archdiocese) of Philadelphia, headed by Archbishop Stefan Soroka. “We are going to assist at the Mass, our priests will be involved in distributing Communion and providing confessions,” he said. Especially with what is happening now in Syria and Iraq, “we can speak of what it means to practice your faith in a time of persecution; some of our families can speak to that and share that,” Archbishop Soroka said. While it has not been mentioned, Archbishop Soroka’s hope is that there will be on opportunity for Pope Francis to visit the Ukrainian Cathedral of the Immaculate Conception in Philadelphia just as Pope John Paul II did during his 1979 visit. New artwork and artifacts there commemorate the modern Ukrainian martyrs, 28 of whom were beatified by Pope John Paul II in 2001. “Our cathedral is one of the best kept secrets in Philadelphia,” Archbishop Soroka said.